Trine: Enchanted Edition released this past Thursday in North America on the Wii U eShop. If you enjoyed the launch title of Trine 2: Director's Cut, then it's an easy choice to pick up this enhanced version of the original Trine. If you aren't familiar with either game, then hopefully my review can assist you! Frozenbyte has seen fabulous success with their Trine series of games. The series has sold millions of digital copies across a wide variety of platforms, include the PlayStation 4, PlayStation 3, PC, and Wii U, the location of Trine: Enchanted Edition, Frozenbyte's latest release. Wii U owners are not strangers to the Trine series. 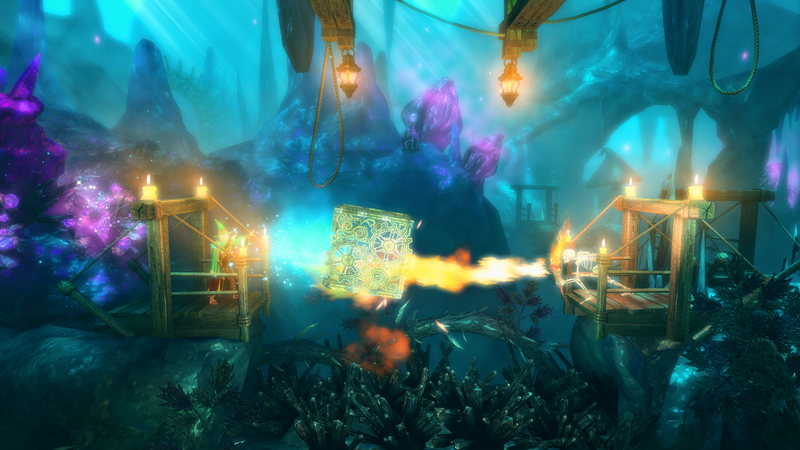 At the system's launch, Trine 2: Director's Cut released on the system to critical success. Now, the game's predecessor is available for the Wii U. 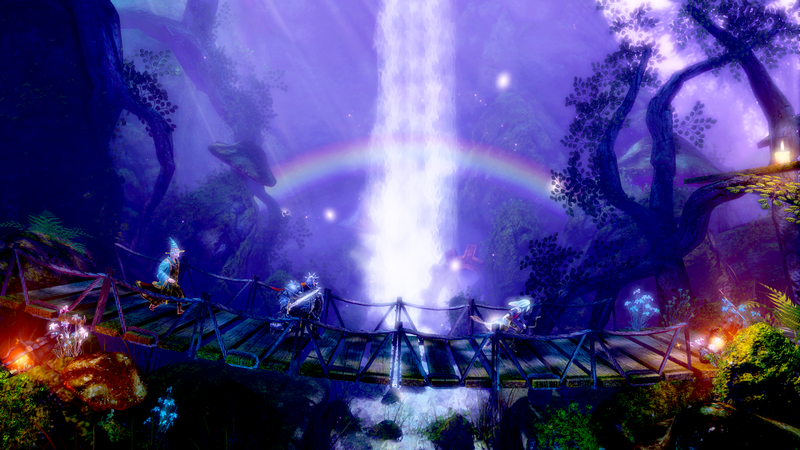 It is just as required playing as Trine 2 was, and that is to say a "must play." Trine is a 2D puzzle platformer which has players assuming the roles of three different characters that can be cycled between with the tap of a button. With each of their own exclusive skills, they enable the player to progress through the game's abundance of physics-based puzzle and platforming challenges. a platform, a weapon, or a shield against enemies. Each of the three heroes has their own uses in and out of battle. The Wizard can conjure up metal boxes for use not only to help reach higher platforms, but also to summon them over enemies so they land on top of them, crushing foes in a comedic display. Meanwhile, the Knight focuses on savage brawn and brute strength, taking out enemies with his sword and reflecting enemy attacks with his supremely helpful shield. Finally, the Thief uses her bow and arrows to deliver damage to enemies from afar, as well as being able to hook onto wooden ceilings and platforms to hang from and swing across chasms. Frozenbyte is to be commended for achieving a character balance so great that each hero is as important and useful as the others throughout the game's approximately 15 chapters. The levels in Trine: Enchanted Edition house more than obstacles and platforming challenges for our trio of heroes to overcome. Green bottles of experience hide and are located in precarious positions, requiring smart exploration to find them. This experience can be used to unlock new skills and abilities for the Wizard, Knight, and Thief. Such abilities include the Knight's ability to dish out more damage with his attacks, the Wizard's ability to conjure more than one metal box to be on screen at the same time, or the Thief's ability to fire two arrows in one shot. Ah, the wooden box: The only way to travel! Alongside experience found sprinkled through Trine's levels, there's also experience to be gained from fallen enemies. While the enemy variety sticks with walking hunks of bone in the form of skeleton soldiers, swordsmen with shields, archers, and fire-breathers, some defeated foes leave behind experience. In addition to finding experience in levels, almost every chapter in the game houses two treasure chests that when opened reveal a special treasure that can be equipped to one of our three heroes. Some of these include health upgrades that adds a small percentage increase to their overall health, added defense to portions of a character's body, and so forth. There are also treasure chests that appear in plain sight that unlock new abilities for the Wizard, Thief, and Knight when they are opened. The Wizard can learn an ability that allows him to summon planks, perfect for bridging gaps, while the Thief can acquire Fire Arrows, great for lighting unlit torches. Meanwhile, the Knight is able to equip a powerful hammer capable of smashing through weakened walls to access hidden areas of levels. to this unassuming bag of bones. Playing Trine: Enchanted Edition on the Wii U GamePad feels fantastic. While it means that you generally have to focus on the less impressive screen of the GamePad, it also means you get a volume of control that feels fantastic. Drawing shapes and lines to summon boxes and planks as the Wizard, and tapping areas of the screen as the Thief to shoot arrows, gives a sense of exactitude that isn't as present when using the right analog stick to do the same tasks. 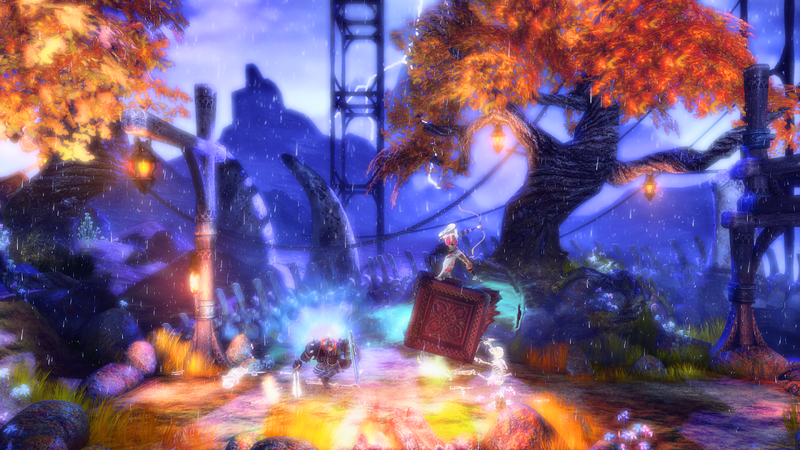 The key differences between the original Trine and this enhanced version is twofold. 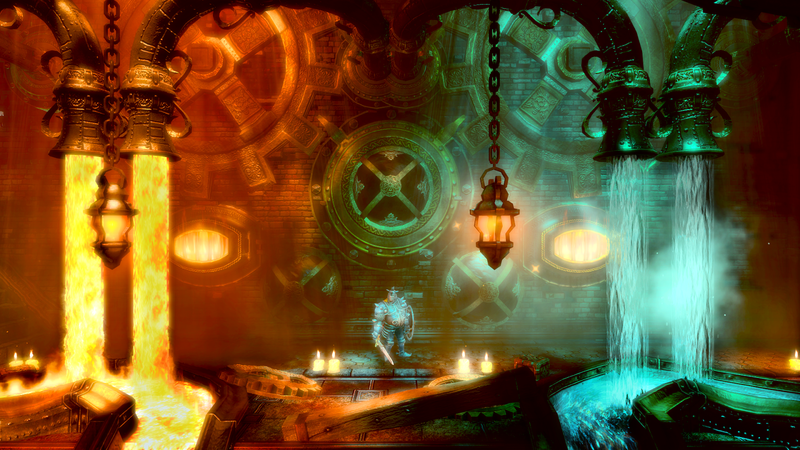 For one, the visuals pack the same punch as the Trine 2, as the game uses the same, upgraded engine. 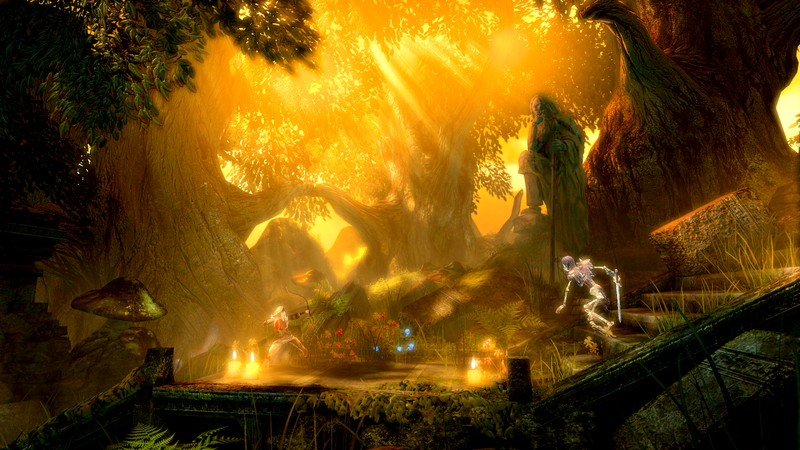 Secondly, Trine: Enchanted Edition offers multiplayer for up to three players (either online or off). 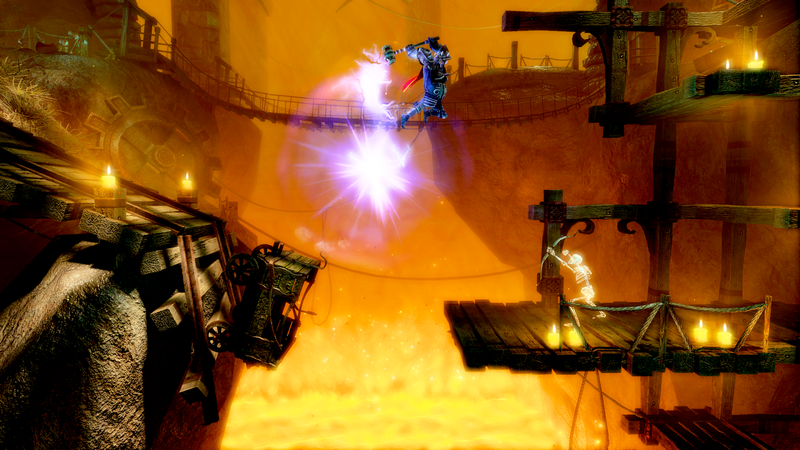 This makes some of the trials of the original Trine dispensable due to being able to create a platform as the Wizard, having other players stand on said platform, and having the Wizard rise the platform to a higher location, allowing the players to skip the intended platforming and puzzle-based challenge presented to them. Other times players need to be on the same page and work together to overcome obstacles thrown in their path. It's a nice balance, and it makes for a totally different climate for the game. So much so that I wanted to play Trine alone and in multiplayer to get both types of experiences, which both ended up being a lot of fun for varying reasons. Three adventurers are sometimes better than one. ...I think that's how the saying goes, at least. At the same time, Trine ends up being a little frustrating for the same reasons, whether you're dealing with multiple people playing with you or yourself by your lonesome. The jumping in Trine, much like its sequel, is a tad floaty, not offering the amount of precision needed to nail precarious jumps and leaps with a level of consistency. Throw in some times when the camera moves while you're in the middle of trying to conjure up an object as the Wizard, completely messing up what you were attempting to summon, and you have some flies in the proverbial ointment of Trine. These aren't impossible to overcome, but they're things that take some getting used to. Trine: Enchanted Edition is a marvel to look at. Your eyes will thank you for bestowing onto them the visual delights this updated version of the original Trine possesses. While most of the time one can clearly see everything a level has to offer, on some occasions Trine can be a little too dark, too bright, or using too many special effects to make seeing where you have to go next a bit of a challenge. This is no further apparent than in the penultimate level, a journey through a tower's fiery foundry. That said, the game is otherwise an aesthetic masterpiece (though some might consider it to be too busy, which I agree at times), and I don't think I'm being too hyperbolic in my statement there. hardest to see where to go. On the sound side of Trine: Enchanted Edition comes perfectly delivered dialogue that sports accents of Ye Olde English descent, perfect for the Medieval fantasy setting the game takes place in. It assists in presenting a fairy tale-like appearance that is of the utmost quality. Frozenbyte has once again graced Wii U owners with another satisfying and captivating game with Trine: Enchanted Edition. It offers an amazing amount of value, clever puzzle design, great gameplay for solo and multiplayer fans, and a presentation that will certainly drop the jaws of most players who take on its challenge. While the platforming isn't perfect in execution, and the final level is a bit tricky for mostly the wrong reasons, the experience of playing Trine: Enchanted Edition is not spoiled by these issues. Trine ends up being a highly engaging game that is pleasing whether you're playing it alone or with others. Review copy provided by Frozenbyte.